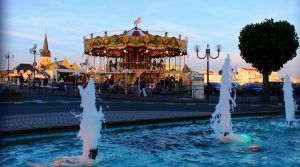 Oh, the humble carousel, a familiar landmark in most French towns, especially those by the seaside. But did you know, the carousel hails from Turkey and the Middle East? The game, which involved tossing a clay ball filled with perfume between riders, was played with such seriousness by the horsemen that the Italian crusaders who first observed the game called it a “little war” or “carosello.” The French adopted this game to help knights prepare for competitions, a practice device was created which featured legless wooden horses suspended from arms on a central rotating pole. A similar display of horsemanship can be seen at Puy du Fou in the show, Secret de la Lance, as well as the jousting tournaments held at Chateau Talmont during their summer pageants. Tourists saw the knights practicing, and thought it looked like fun….and so the Carousel was born, and thanks to the advent of electricity and the imagination of a Bolton man, who used farm machinery to power the Carousel, they played a pivotel role in the populairty of fun fairs that started appearing in the Victorian era. 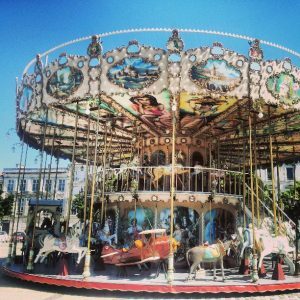 Reaching their heyday in the Edwardian period, many carousels today are still based on the original designs, with ornate carriages, and guild ponies, delicate lights and mirrors, and exotic animals of the time, including lions, tigers and even giraffes. 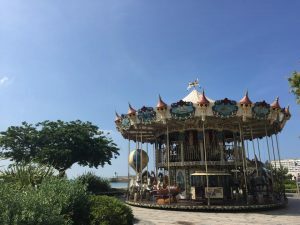 A holiday to the seaside isn’t complete without at least one turn on a carousel, and with beautiful examples at Les Sables d’ Olonne, Saint Gilles Croix de Vie, and La Rochelle- there’s no excuse!